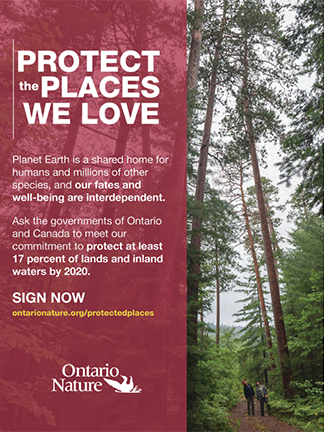 On the 10-year anniversary of the protection plan for one of southern Ontario’s most treasured landscapes, Ontario Nature and fellow environmentalists concede that the fight for the moraine is not over yet. 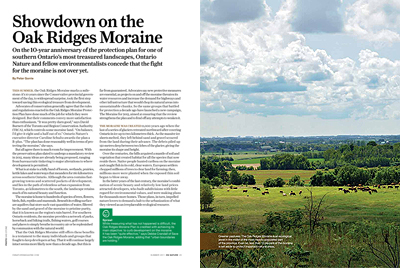 This summer, the Oak Ridges Moraine marks a milestone: it’s 10 years since the Conservative provincial government of the day, to widespread surprise, took the first step toward saving this ecological treasure from development. 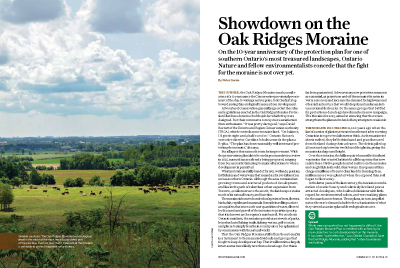 Advocates of conservation generally agree that the rules and regulations enacted in the Oak Ridges Moraine Protection Plan have done much of the job for which they were designed. But their comments convey more satisfaction than enthusiasm. “It was pretty darn good,” says David Burnett of the Toronto and Region Conservation Authority (TRCA), which controls some moraine land. “On balance, I’d give it eight and a half out of 10.” Ontario Nature’s executive director Caroline Schultz awards the plan a B-plus. “The plan has done reasonably well in terms of protecting the moraine,” she says. But all agree there is much room for improvement. With the preservation plan slated to undergo a mandatory review in 2015, many ideas are already being proposed, ranging from bureaucratic tinkering to major alterations to where development is permitted. What is at stake is a hilly band of forests, wetlands, prairies, kettle lakes and waterways that meanders for 160 kilometres across southern Ontario. Although the area contains fast-growing towns and scattered pockets of development, and lies in the path of relentless urban expansion from Toronto, 40 kilometres to the south, the landscape retains much of its natural beauty and function. The moraine is home to hundreds of species of trees, flowers, birds, fish, reptiles and mammals. Beneath its rolling surface are aquifers that store such vast quantities of water, filtered by the sand and gravel of the moraine to pristine purity, that it is known as the region’s rain barrel. For southern Ontario residents, the moraine provides a network of parks, horseback and hiking trails, fishing waters, golf courses and places to simply breathe in country air or be replenished by communion with the natural world. That the Oak Ridges Moraine still offers these benefits is a testament to the many individuals and groups that fought to keep developers at bay. That it will continue largely intact seems more likely now than a decade ago. But this is far from guaranteed. Advocates say new protective measures are essential, as projects on and off the moraine threaten its water resources and increase the demand for highways and other infrastructure that would chop its natural areas into unsustainable chunks. So the same groups that battled for protection a decade ago have launched a new campaign, The Moraine for 2015, aimed at ensuring that the review strengthens the plan and to fend off any attempts to weaken it. Site-alteration and tree-cutting bylaws were left up to municipalities. The provincial government was supposed to provide a template for them, but has not. Most municipalities have bylaws, but a few – particularly at the eastern end of the moraine – do not. Too few officers are available to enforce the bylaws and mainly respond to complaints rather than take proactive measures. As for watershed or stormwater management plans, a majority of municipalities have them, but a significant number don’t. The plan allows roads, electricity transmission lines and other infrastructure to be built even in core natural areas, as long as governments or other proponents can demonstrate that such infrastructure is needed and no alternatives are available. “Everything gets through that filter,” says Debbe Crandall of Save the Oak Ridges Moraine. Land restoration is not new to the moraine. Over the past 150 years, millions of trees were chopped down to create farms. When the farms failed because of poor soil, millions of trees were planted. 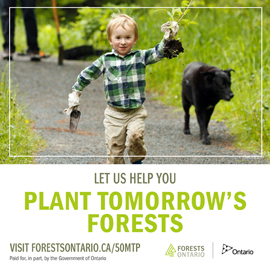 The Oak Ridges Moraine Foundation’s Caring for the Moraine Project has planted more than 430,000 trees on 289 hectares, restored 310 hectares of prairie and 17,890 metres of streams, and created or enhanced 24 hectares of wetland. The province promised to produce “performance indicators” to assess the moraine plan’s success and prepare for its review in 2015. It hasn’t, and municipalities have done little to assess water quality in streams and wells, as well as stream flows and the health of plant, bird and animal populations. The Oak Ridges Moraine Foundation and the Conservation Authorities Moraine Coalition have stepped in to examine the moraine’s environmental health. Their first report shows that only seven of the moraine’s 49 watersheds have E. coli monitoring stations, just six adequately measure salt and 21 track phosphorous. Only 16,452 hectares, or 8.5 percent, of the moraine is set aside to protect significant or highly sensitive natural areas. (For comparison, 26 percent of the Niagara Escarpment is protected.) The area has increased by just 2,259 hectares during the past decade, and accomplishing even that required determined effort by conservation authorities and groups such as the Oak Ridges Moraine Land Trust. There is no target, dedicated funding or strategy for acquiring more land. The situation “make[s] some parts of the plan vulnerable,” states a recent assessment commissioned by the Oak Ridges Moraine Foundation. Water is the most crucial resource on the moraine and one of the major concerns with regard to the protection plan. York Region pumps about 50 million litres of water daily from aquifers beneath, or connected to, the moraine. A similar amount leaks from the aquifers into the sewage system that carries wastewater to Lake Ontario. More water is pumped up through wells for human and industrial consumption, farms, golf courses and other uses on the moraine. The upshot is that less cold, clean water flows into streams, so they warm or dry up, killing fish. These are not the only problems. Three levels of aquifers lie beneath the moraine. The deepest one contains naturally occurring methane and dissolved organic matter. When the shallower aquifers are drained, underground pressure is reduced, allowing the water, gas and dissolved organics to rise and destroy wells. Runoff from urban areas and farm fields, meanwhile, contaminates ground and surface water. Many development plans – probably dozens though the exact number, or an estimate of the area they cover, is not available – had received draft approvals when moraine conservation was enacted. Those plans were grandfathered, but ambiguity exists about which of the new laws apply to them. Rather than settle the issue in court, conservation authorities are engaged in time-consuming negotiations with developers to induce them to improve conditions such as setbacks from streams and wetlands, and protection or planting of trees.